Grapefruit is good and cheap in the winter, making it an ideal fruit flavor for winter cocktails. Here I've paired rye whiskey with grapefruit, Cynar (a artichoke liqueur) and a homemade rosemary-brown sugar syrup. It's a nicely balanced drink, a bit tart and a bit herbal. 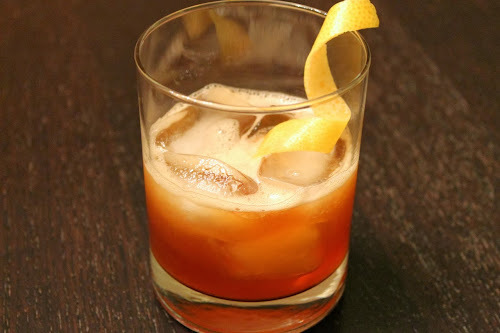 Combine whiskey, grapefruit juice, Cynar, rosemary-brown sugar syrup and bitters in a shaker with ice. Shake until cold. Strain into a rocks glass with ice. Garnish with grapefruit twist. Combine ingredients in a medium saucepan and bring to a boil. Remove from heat and steep for 10 minutes. Strain syrup to remove rosemary. Keep syrup in refrigerator. I think you came up with the name for this one. I'm glad you liked it.